We thought flash demand was booming, but flash supplier Sandisk's quarterly revenue has dropped to its lowest point in seven quarters after price drops and demand falls. It expects the next quarter to be even worse. Revenues in its first 2012 quarter were $1.21bn, down 7 per cent year-on-year and a thumping 24 per cent sequentially. Net income was $114m, down 59 per cent compared to the previous quarter and 49 per cent compared to the year-ago quarter. Oops: someone misread the market. The chart shows the quarterly revenue and profit history. Sandisk gave a warning of this state of affairs in April. It claims the price cuts were necessary because of slumping demand and competitive pressures. President and CEO Sanjay Mehrotra said: "Our first quarter results were adversely impacted by lower-than-expected pricing and demand weakness in certain segments and we expect similar trends in the second quarter as well. We believe a seasonally stronger demand environment in the second half of the year, combined with our diversifying portfolio of mobile and SSD solutions, will allow us to deliver strong sequential revenue growth in the third and fourth quarters." In other words the second quarter is going to be bad too, with "a sequential decline in revenue", and then things will pick up. 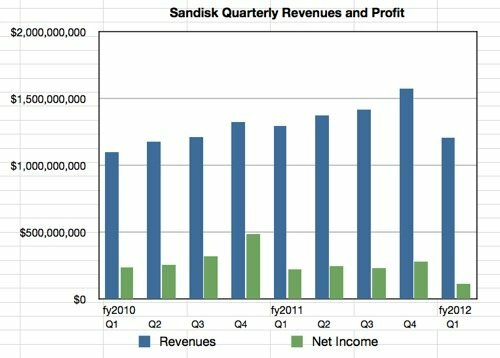 Sandisk expects second quarter revenues to be within the $950m to $1.05bn range, revenue numbers not seen since before 2010, and expects an 8 to 13 per cent decrease from the first 2012 quarter. In remarks prepared for the earnings call, Mehrotra said: "Industry demand has been weaker than we had expected and we believe supply has increased more than we had estimated at the beginning of the year." The second-half pickup is being pinned to "the ramp of new smartphones, tablets, Ultrabooks and enterprise solid-state drives along with stronger seasonality" – meaning the company expects demand to pick up generally in the second half. The demand fall was seen most in "lower than expected demand for mobile cards from certain OEM customers with whom we have high share". Sandisk definitely misread the market: "We had expected pricing trends to moderate later in the first quarter but instead, the rate of price decline accelerated even more." The second quarter will be bad because the supply/demand imbalance is expected to carry on, as is the weak level of OEM demand. Also sales to the embedded flash business in tablets and mobiles will need "iNAND [and] customer-specific multi-chip package and other unique and proprietary products" – where Sandisk misread the market too. Mehrotra added: "We have been somewhat late in adapting our product roadmap to the broad set of requirements of the leading OEM customers." The firm is scrabbling to get product development back on track and expects product ramps in the second half of 2012. Sandisk is also delaying the production ramp in its Fab5 facility to avoid producing too many NAND chips. Retail and enterprise SSDs apparently did well. Also: "Our embedded SSD offering, the SanDisk iSSD, has secured several new design wins in Ultrabooks ... For the enterprise market, we have begun qualification of our latest generation of 6Gbit/s SAS SSDs at key OEMs. Our PCIe products are on-track to begin shipments in the second quarter." However these are niche products in Sandisk's overall mix: "Growth in our client and enterprise SSD revenues remain on track to account for more than a 10 per cent mix of our total revenue for the year." The company urged its shareholders was not to worry: "We are very confident about the long-term prospects for SanDisk in light of the secular growth drivers for our business from smartphones, tablets, Ultrabooks, and, in particular, client and enterprise SSDs."